Join us this week as we feature our guest, Dr. Paul Hayne from JPL. 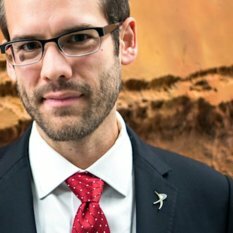 Dr. Hayne studies snow and ice on Mars, extreme temperatures of the Moon, and is a science collaborator on the Cassini mission to Saturn. He also founded the group Young Scientists for Planetary Exploration to help organize early-career scientists to be aware of the politics of space. 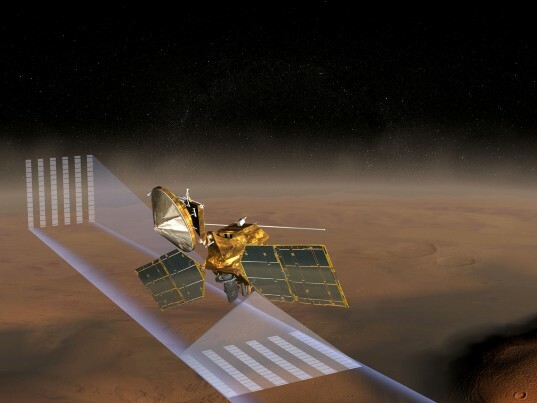 As Mars Reconnaissance Orbiter flies about 300 kilometers (180 miles) above Mars' surface, it almost continuously scans the surface and edge of the atmosphere with the Mars Climate Sounder to build up a "four-dimensional" view of the temperature, pressure, and composition of the bottom 80 kilometers (50 miles) of Mars' atmosphere over the course of one Martian year. Good idea to provide the possibility to pose questions here in andvance, thanks! Of those many questions that arise, I'll pick out three complexes: -1- Many rocks around Yellowknife Bay look tilted, displaced, lifted up or sinked down. So the first kind of questions: What do you know or suspect about (ancient and recent) mass movements on Mars and Moon? Besides obvious rockfalls, are there indications of movement by thermic cycling, solifluction or other kinds of displacement like solids behaving like very viscid liquids over large time scales, even for small inclination? AFAIK, on Moon microsisms induced by temperature changes were detected. -2- Dust levitation is known from Moon. Mars is also a very dry environment, so what is the current estimate about electrostatic dust levitation outside dust devils? What is known about the relation of van-der-Waals and more distant electrostatic properties of Marsian dust? -3- Marsian dust contains iron oxides. Is it known, whether it contains magnetic magnetite? Btw. there exist nice sound tracks of dust from Saturn rings colliding with Cassini. 1) Most of the surface modification on both the Moon and Mars is due to impact cratering and related processes. Volcanic activity has also occurred in the past on both, although there is no strong evidence that it continues today. On Mars, aeolian (i.e. wind-driven) erosion also plays a role in moving mass around, especially when the atmosphere is dusty (which is often!). Fluvial erosion (i.e. water) was clearly important on Mars several billion years ago, but this activity has tapered off and may or may not occur today; if so, it is confined to isolated spots and seasons. Flow-like features at mid-latitudes on Mars may be related to glacial or periglacial processes in the relatively recent past due to changes in the planet's spin axis. The type of fracture by thermal cycling you mention probably does occur on the Moon and other airless bodies, due to the extreme daily temperature changes near the surface (-185 C to +125 C at the equator!). This may be one way to produce fine-grained regolith on asteroids, where micrometeorites have slower typical impact velocities than on the Moon. The only liquids on the lunar surface were ancient lava flows and impact melts, which have since solidified. (2) I am not familiar with any studies on electrostatic dust levitation on Mars, but there is some evidence it occurs on the Moon. On the other hand, we have evidence from Diviner (watching the lunar surface cool during eclipses) that not more than a few millimeters of this levitated dust accumulates in any one spot. (2) Magnetite has been found in Martian meteorites, but I am not aware of any confirmation that it exists in the dust on the planet's surface. Thanks for the questions, and keep exploring! Thank you very much for your profound answers! They helped me (and hopefully others as well) to better understand the prevailing processes on the rocky celestial bodies, and the current state of knowledge. I think, we need to learn more about Marsian dust and how to handle it (among many others), before astronauts may be sent to Mars.